Misc. 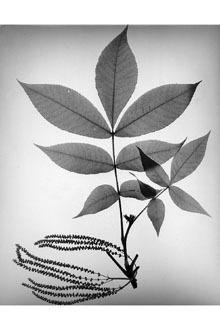 One of the region’s most common hickories, it is distinguished from other hickories by its large whitish buds and large, pubescent leaves with 7-9 leaflets. The kernel of the nut is edible. Hickory is an important mast species for wildlife. Squirrels, bears, rabbits, rodents, beavers, chipmunks, fox and many bird species consume the nuts. Its hard wood has many uses: dowels, tool handles, ladder rungs, gym equipment and more. The tree is also important to cavity nesting animals.